This is something I would always turn my nose up at, as I universally hated cauliflower. But I must say, I’ve done a 360º on this and it’s now one of my top 10 hangover cures. It’s fanstastic on it’s own and even better with roast meat. It may not be the most exotic of dishes, but that doesn’t stop it being incredibly satisfying. This will serve 4-6 people. Preheat oven to 180ºC. Lightly butter a large gratin dish or ovenproof dish. Bring a large pan of lightly salted water to the boil and cook the cauliflower for 6-8 minutes until just tender, drain and set aside. Melt the butter in a pan over a medium heat and add the flour and cook until just turning golden.Pour in 1/2 the milk and stir vigourously until smooth. Stir in the remaining milk and the bay leaf, nutmeg and a little salt & pepper. Reduce the heat to low, cover and simmer for 5 minutes, stirring occasionally. Remove from the heat, pick out the bay leaf and discard. Add 1/2 the cheese and stir in well until completely melted. 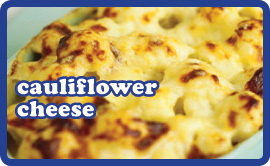 Arrange the cauliflower in the oven dish and pour over the cheese mixture. Sprinkle over the remaining cheese and bake in the oven for about 20 minutes until beautifully browned and bubbling. Serve on it’s own with bread or on it’s own with roast beef! CAUTION: Be very careful eating this as cauliflower has a tendency to retain heat like nothing else and it’s pretty easy if you’re impatient like me, to burn your mouth if you’re too greedy.